Ladies and Gentlemen, I&apos;m going to keep it short this week because I&apos;m still recuperating from the Tyrese Gibson&apos;s MAYHEM! launch party. Tyrese, you are the muthafuckin&apos; man! It was an amazing event filled with celebrities, great people, beautiful women all around and good food and (did I forget to say beautiful women all around?) I kicked it with the MAYHEM! 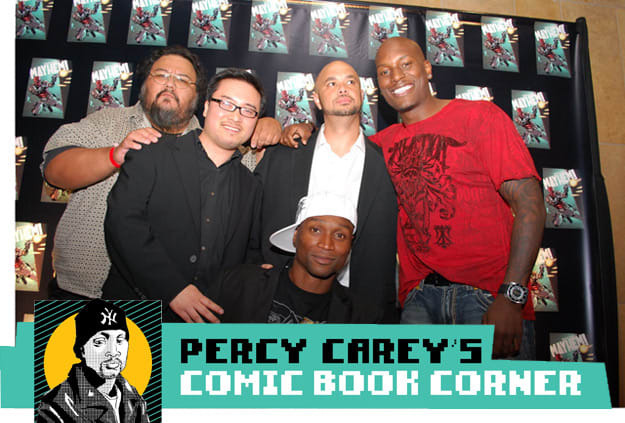 creators Tyrese Gibson, Mike Le, William Wilson and the legendary Mr. Tone Rodriguez at Lucky Strike (LA Live). I even had an opportunity to sit down one on one with my friend, director/executive producer Micheal Bay (Transformers 1 and 2). There&apos;s rumors brewing about a meeting between Avi Arad and Tyrese Gibson at a trendy LA eatery named Cecconis on Monday. Well, here is the PROOF! I just obtained these photos of Mr Gibson and Mr. Arad (an a unidentified guest) leaving the restaurant from www.humormillmag.com. It&apos;s assumed the dinner meeting was about Mr. Gibson playing as Luke Cage or Black Panther and there&apos;s some rumbling of him being courted to create a comic book for MARVEL. I&apos;m not sure what was exactly said yet, but I will personally contact www.humormill.mag, since they were on the scene and see what I can get for you. If anyone get updates, please post them here. Thank you.